A pocket watch made for Ethiopian Emperor Menelik II, dating back to 1893, is displayed during an auction preview in Geneva last week. An historical pocket watch made for Ethiopian Emperor Menelik II (1844 – 1913), “The Negus Watch” dates from 1893. The Watch was a gift to Léon Chefneux in recognition of his contribution to the implementation of Ethiopia’s first railway line, as inscribed on the inside of the case ‘Don de Sa Majesté Menelik II Empereur d’Ethiopie’. The Monarch’s reign was characterized by progress, innovation and modernity. 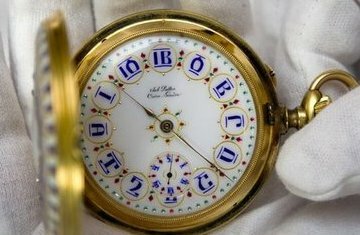 Estimated at CHF 30,000 – 50,000 (US$ 29,100 – 48,500) this very rare and historically important 18K yellow gold chronometer pocket watch with detent escapement made by Lattes has a white enamel dial, enhanced with blue and white enamel decoration, polychrome writing in Ethiopian symbolising the hour indication, subsidiary seconds, a white enamel replacement dial and a back cover representing the royal crown of Menelik II. It is fully set with rubies and diamonds, accompanied by its presentation case and the original First Class Geneva Observatory Certificate. Beautiful..this shows our rich and old our culture, the unique numbers and alphabets..I believe it belongs in an Ethiopia’s museum (if we have one, I’m not sure). Fantastic, look at the numbers, the young generation do not know it, this country (ETHIOPIA) is great, with great history. Even, I am quite sure there are other treasures hidden there. We need it back in Ethiopia. Do you think it is Axum? It would be better in the hand of others than being in Ethiopia. This is a beautiful historical object, it should be kept in a museum not in someone’s prvate collection. It is very beautiful. King Minilik created Ethiopia, a place of men like tewodros! The wach was stolen from Virginia USA and we know who the person is we are very upset about it. At this time we are organizing to make sure the person is cought and send to gail and the wach to be returned to the Ethiopian museum. This wach was in the house of the late Crown Prince here in Virginia it was stolen by the servant. the servant said he stole it because he was refused to be paid his salary for two years, he took them to court but he didnt get the money so he took action on his own taking so much goled including this wach which he is proud to telling us and the discription the wach feets exactly what is shown in the picure. the Ethiopian Government need to investgate this matter as soon as posible. The wach was given a gift to King Menelik not to any body else and it belongs to Ethiopian museum. The watch that was given to Emperor Menelik was stolen from the Royal families house here in Virginia USA by the servant who was pushing the late crown Prince Asfawisens wheekchair. The servant stole much jewelry including the that is for auction. all this was reported to the police here in Fairfax Virginia. He sold the jewelry with the help of few people from 2004-5-6 except the watch. The watch was with him up until 2007. The mother of his two children who is residing in Toronto is the contritutor to all this. this should be investigated and the watch should be returned to Ethiopian museum because its our history and treasue. Are you telling a lie? It sounds like you are telling a lie. If it is really true, you should be going to the police instated of commenting on a blog. Something smells fishy, fishy here. which police do I tell? here in America, Ethiopia or Swetherland? the Royal Family have reported to the police here in Fairfax county at the time. but some how he didnt go to gail instiad he got away with all that he stole and here we are Emperor Meneliks watch in auction. he was bragging about it ok! to late for me to go to the police about it. but he has told me the wach was in his hands. I ask him if he can show me the watch other wise I wasnt going to belive him, he said the safty box key is not with him instaid he describ the watch to me wich is exactly what is in the picture. I new now he was telling me the truth. instead of asking me if I am lying, please investigate or lets all ask the Ethiopian Government to investigate okay! We called the auction to find out where they find the watch their answer was its confidential. I dont know who came back with the idea that King Menelik gave the watch to some one else. the watch shouldnt be confidential because it is official and the Ethiopian Gov. if they realy care about thier history and treasure, they should investigate and bring this historical watch back where it belongs. because this is a history beteewn the two countrys. It is not surprising at all that Emperor Menelik would give such prized gift to someone who has done professional development work in the country at the request of the king. Ethiopian emperors gave gifts on a regular basis. It was part of protocol. Part of doing diplomatic business. There are many people around the world who have received gifts from Menelik that are even more beautiful than this watch. So it’s kind of an insult to Menelik’s memory and Ethiopians to say that Léon Chefneux did not receive this gift. Yes he did. Do you know who he is and what he has done? Do you know that he was a personal friend of the Emperor? Do you also know that he was a very wealthy person in his own right. So please check your fact before you spread unverified, yemender-coffee rumor. Stop insulting Emperor Menelik and Ethiopians. We don’t need to get back the gift we already gave. We are not that cheap. tazabi, how do you know that King Menelik gave this watch to Leon? do you have any evedence on that any decument that says that the King gave away his gift to leon? if some one gave you a gift, do you give it away to some one else? especialy if your name is written all over it, especialy if the gift is from a very important person and place, can you answer all that please? you sound like child. we are not cheap, the world knows that. but we are not un greatfull to give away that is given to us ethore if we did, that is cheap not give the gift a value ok! grow up. I have hurd a lots of storys on how the king was kind and a giver but briliant enough not to give such history. know I say that is un insult to King Menelik to me! Ethiopian is not making sense. Much ado about nothing. tazabi, do you know if Leon Chefneux knows how to reads amharic or Gehz numbers? unless King Menelik have send him to kolo timhirtbiet to study those numbers, how do you think he is going to use it? sorry I forgot to ask you earlier. with all due respect, can you please tell me that? Ethiopian, how do you know all these secrets? Were you also one of the servants employed in the house? Because family members would not disrespect themselves like you. Shame! I couldnt get over Tazabis comment that says Leon Chefneux was very wealthy and he was a personal friend to Emperor Menelike and that is why the King gave him his gift as a gift. Tazabie speaks like he knows every thing. where is the decumment to suport all that. I think Tazabie should say Leon was happy to do business with the king and he gave the king a watch as a gift writen in ghez # so that the king will not have a proplem in using the watch. it sounds Tazabie got it the other way round. you are confused. By the way Tazabi, you said Leon Chefneus was very rich, do you think Leon Chefneux got poor now? and do you think that why he is saling the watch? I look for ward to your answer. I understand. The truth hurts. You will get over it! Tazabi, what is the truth? you sound very erastional, why dont you just come with the evidence that the king gave away his gift to Leon as a gift? tell us if Leon reads Ghez, where Leon is now to sell the watch, who sold the watch first and to who, you said Leon is or was very rich, did he got very poor now to sell the watch? is he still alive to sale the watch? if so where dose he and his family live? TAZABI, you are reading what is folse. the thif is saying that not to be cought. dont you understand? its an excuse so that you and I will never suspect any thing else other than that. Let me tell you some thing, King Menelik is a visionary, brave, smart and compationet regardless of what some wicked one say. so my dear, lets just work hard in getting the watch back where it belongs. forget the ego verdict. I was half sleep when I wrote to your re-sponse, SORY. Anyways, I just want you to know the man who stole the watch didnt steal only watch it is with other jewelry and the royal family stamp whom he also used it to make money. and all this was reported to the police and it is recorded. with the help of some people whom we know in Virginia, who gave him a shelter and help his to sale some of the jewelery in order to buy a car for business and radio air time that he was using to blackmail and scare people that he dont like every sunday at 9 pm saying to people if you dont do what I ask, I will expose you on the raio is what he was doing here in America. so many people we know him were scared of him. I wish I can say so many things that this man of what he did to so many in this e-mail but I cant. this canartist have cannd countrys, Royal familys and individual people every where. there is a lot to say about this man but not now. Right now, lets just concentrate on getting our treasure back to our meseum okay. as of the theif, beleave me he will be he will be cought one of this days just like Tamrat Geleta. for all the crimes he has commited. Mimi, I said this before, grow up. I dont have to be a servant to know this story. how do you know who I am telling this story? do you think only the sevant know about the other servant? do you think the servant is the one who lost the jewelery? do you think the servant is the one who called the police to report about the jewlery thief? what makes you think I desrspect the royal family? because I tell the story? is that it? in that case, Tadias news is also a servant. Well if you are concerned about the royals respect, go cach the man who have done all that to them. if at all I am defending them. but then again I believe you are just a chiled you wouldnt understand. in the future, there is going to be more information coming. stick around with an open mind and lesten okay! MIMIYE.